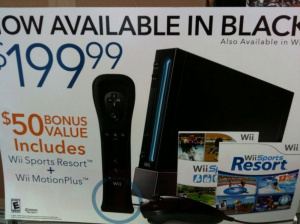 Appearing to mimic the same bundle available elsewhere, your $200 will nab you a Wii, Wii Sports and Sports Resort with MotionPlus, with every accessory rendered in a lovely dark hue. The advert makes no mention of a release date as it was clearly intended to be displayed after launch, but if Gamestop stores are receiving them now we can only speculate the machine will be available in a very short space of time indeed. More news as it happens. Hm... Shame this doesn't come with Monster Hunter Tri, hahaha. If you do not have a Wii, buy this when it comes out. Such a good deal! I want one so I can pretend it's my PS3's baby. I already have a Wii, and I'm still buying it. That's a helluva good deal. I have a black Wii and it looks great, but it's dust collector and doesn't hide hand smudges very well. However inside that big box you get a cleaning cloth!! Seriously?! $200.00? That's crazy cheap for a console like this. I have too much VC and WiiWare content to get this and sell my old white Wii. I do like black finishes though ... even if smudge marks are more noticeable on them. 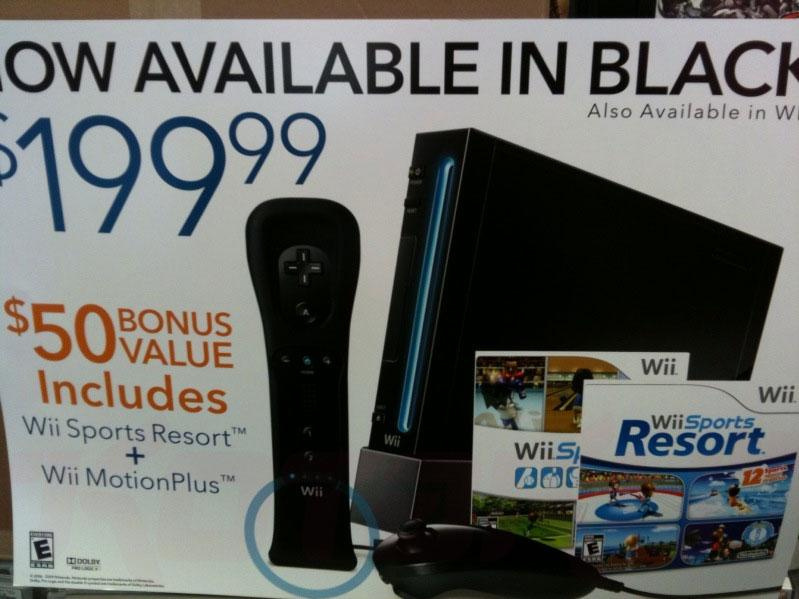 You get the Wii, Wiimote and Nunchuck in black, plus Wii Sports Resort and a black WM+ FREE. Great value for those that don't own a Wii. If I could transfer my data from my current Wii to this black beauty I would definitely pick one up. This should have came out along with the white one...I wanted to get the black Wii back then, now that I have so much Wiiware an VC games this is useless to me. Hope I can get Nintendo to do a "repair" on my console by cleaning out any viruses and stuff, and while they're at it, switch the casing. That'd be cool. I see I'm not the only one with the problem. ...and this is the reason I haven't repurchased a Wii. I will buy on release day wit Muramasa and NIGHTS. Great deal! Will the White ones be discounted since they don't have Resort or M+?